Like all things that Charlotte Mason advocated, music appreciation can be gently and naturally offered. In our family, we choose one composer to listen to for six weeks at a time during our music appreciation time. My high school age sons and I keep track of each piece we listen to and record our thoughts and inspirations after listening to the music. The log sheet keeps it simple and it allows for them to express what they like and dislike about the music. Younger children can orally narrate back their thoughts and feelings after listening to each composer’s piece. You can download the Music Appreciation Log Sheet HERE. The log sheet you can download HERE is a variation of one we have been using for the last three years as part of our high school music appreciation course. 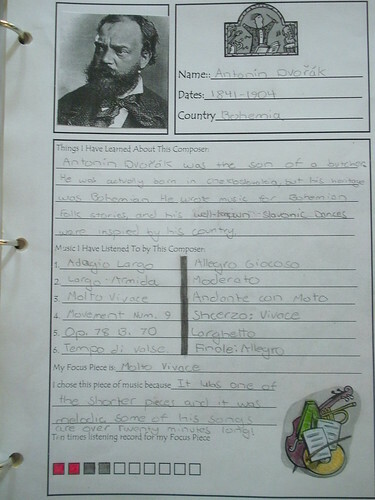 It helps my sons list the musical selections they listen to and record their thoughts about each composer. 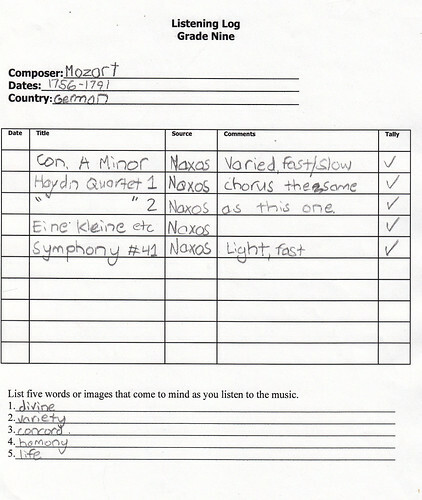 At the end of each six week period they then write a brief summary expressing their opinions about the composer. It also helps me to see that they have been actively listening during their music appreciation time. I encourage them to listen to a favorite piece at least ten times during the six week period. Somewhere along the line I started to keep my own set of log sheets, recording my list of pieces I have listened to and my thoughts and impressions about the music. Upon reflection, I realize that listening to and recording my thoughts on each composer is part of my recharging time. It is time spent doing something I enjoy for myself. It is “me time” without needing to be removed physically from my family. 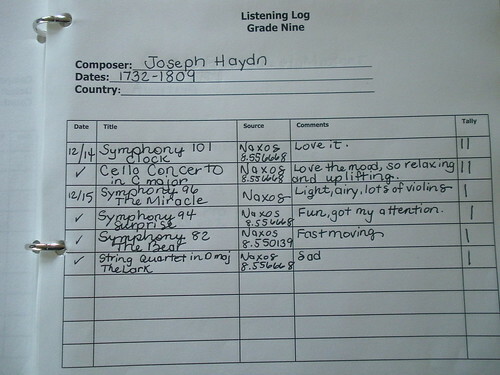 I also use the log sheets as references when I am deciding on music to listen to in my free time. The lists remind me which music I enjoyed and I can easily listen again for my own pleasure. One period of music, one time a week will take approximately 10 minutes. Don’t you have 10-15 minutes in your week to spare for this important element of your child’s education, developing a life-long love of listening to great music? Harmony Fine Arts Grade One has become a popular plan for art and music appreciation for many families just getting started with these subjects in their homeschooling. I created these plans from our family’s experience with art and music appreciation and they can help you too. To see more of what is offered with Harmony Fine Arts plans, click over to my Harmony Fine Arts website. This is a great and very useful post. Thank you, I am going to photocopy the listening log and use one for my children and another one for myself. I love the listening log! Why didn’t I think of that? Thanks for sharing. Thank you so much for sharing the listening log! I love it sooooo much! You’re so awesome! Oh Barb, can we be neighbors? You are such an inspiration. You continue to inspire me. Thanks. The listening log is a great idea! I am a former music educator so this is right down my ally and have a place to write down a few notes while listening would definitely help older children to focus on listening. Great idea! I’m stopping by from Trivium Tuesdays!